Daisy Fitzjohn knows there are two worlds: the outside world and the world of Brightwood Hall, her home--and the only place she’s ever been. Daisy and her mother have everything they need within its magnificent, half-ruined walls. They may not have a computer or phone, but Daisy has all the friends she could want, including a mischievous talking rat named Tar and the ghostly presence of a long-ago explorer who calls herself Frank. I'm not sure quite what I expected this book to be, but I found it a rather surprising sort of read. 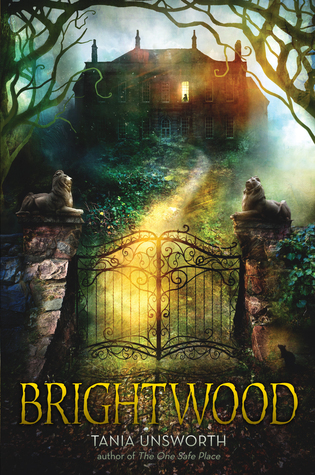 For one thing, there are only two human characters for most of the story, and secondly, the house, Brightwood Hall, is such an integral part of the story that it almost feels like a character itself. Daisy's mother, Caroline Fitzjohn is the first person we meet in the story, just as she and her family set off on their yacht. But Caroline leaves to ship to go looking for her doll's lost shoe and thus is the only family member to survive a terrible accident. Unfortunately, the trauma of losing her whole family leads Caroline to start hoarding things in what she calls "day boxes". Each day box contains miscellaneous items that represent the events of the day. The problem is that over the years, Caroline accumulates thousands of these boxes and ends up having major shelving installed throughout the mansion. Daisy, of course, grows up surrounded by her mother's boxes and her hoarding of food and other supplies, so none of it strikes her as unusual, not at first anyway. But Daisy has never left Brightwood Hall, so the outside world is unknown to her except for what she has read about in her studies with her mother. When her mother leaves to go to town one day and doesn't return, Daisy is left to care for herself and wonder what happened to her. But her rather unusual friends, a rat named Tar, and a ghostly, imaginary explorer girl named Frank, help her cope. But when a stranger shows up who seems to know the place, but who is surprised to see her, Daisy's feelings of unease grow. Daisy's suspicions grow bigger as it becomes evident that this man has a rather uncomfortable connection to her mother. When Daisy is forced to confront the man her life really, truly becomes endangered. This is definitely one of the most unusual thriller/mysteries that I've read for the middle grade crowd. Maybe because the only real help Daisy has is an imaginary/ghost girl who comes and goes at awkward moments. Daisy really is pretty much on her own. And since she has no real experience with anyone other than her mother, it creates a lot of tension when the stranger shows up and she doesn't know how to handle it. But Daisy is a character that it is very easy to root for and she has loads of courage and good sense. But it's going to take all she has to save her home, herself, and find out what happened to her mother. I'm so glad you found this book to be interesting. I have it sitting on my TBR shelf and I've been wanting to get to it for a while now. It's on my list to read this summer. I usually enjoy middle grade thrillers, so I'm expecting to like it!